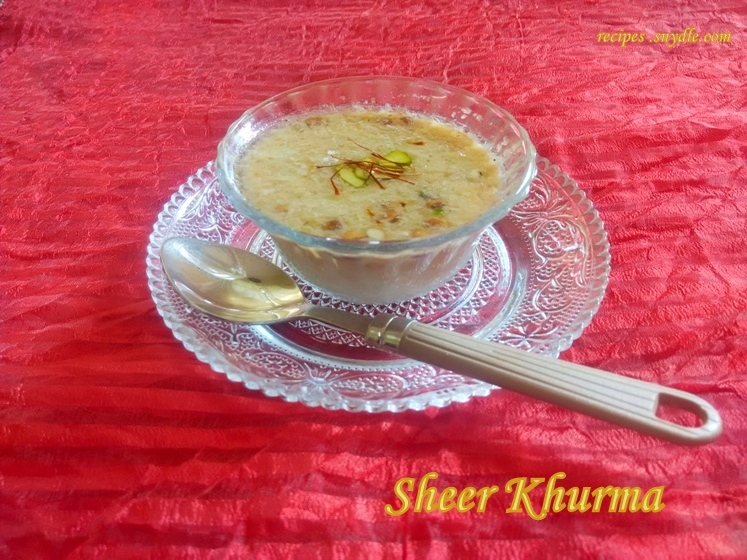 How to make Sheer Khurma Recipe with step by step pictures. 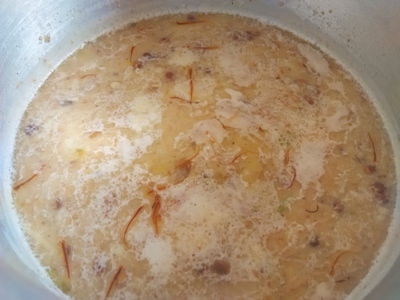 Sheer Khurma comes from the mughlai cuisine. Specially made during the festival of Eid-ul-fitr/Ramazan Eid. 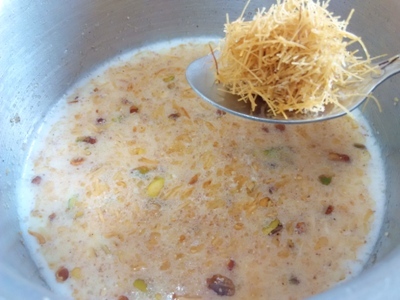 Sheer khurma is another version of vermicelli pudding and can be called as the rich dry fruits and vermicelli pudding. 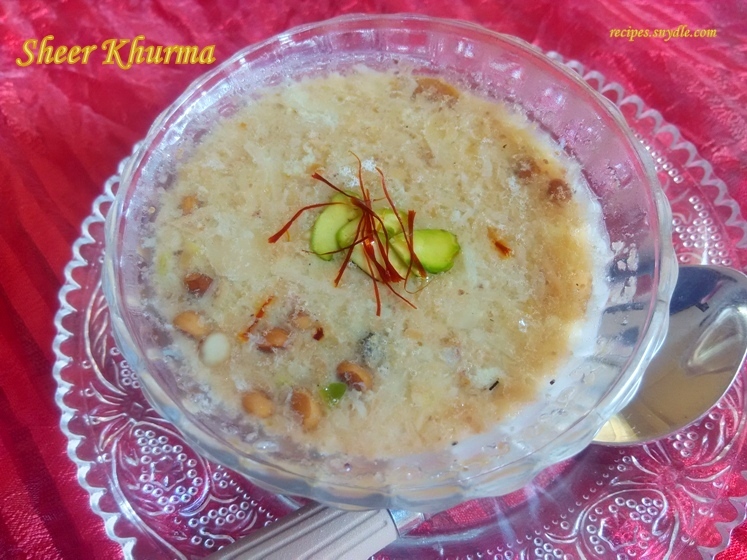 Sheer khurma is a rich mughlai dessert. 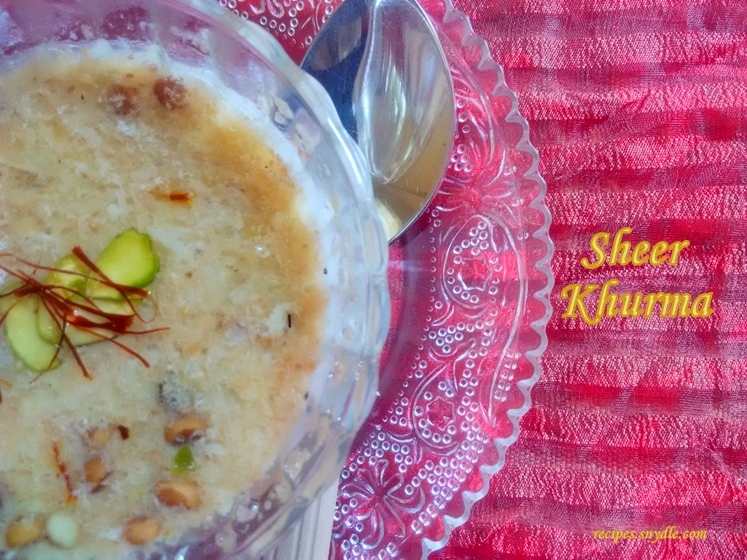 Sheer khurma contains lots of dry fruits like pistachios, cashew nut, almond, charoli and dates followed by coconut, poppy seeds, kesar, khoa and roasted vermicelli. Milk is the key sheer khurma ingredient. 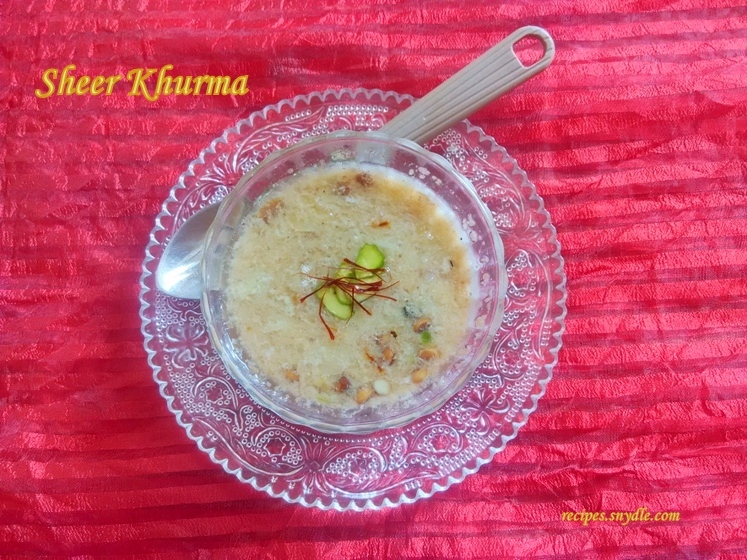 Sheer khurma recipe is simple but requires preparations to be done before hand. My friends and known ones many time ask me sheer khurma banana ka tarika. There are many ways to prepare sheer korma recipe, where you can also include cardamom powder and raisins which will add to the taste. Here I have not use cardamom powder for the reason that I have added saffron and khoa/condensed milk to the sheer korma. now sliced dry fruits are easily availabe in market, so you cab use readymade sliced dry fruits which will reduce your time and efforts to make sheer khurma. 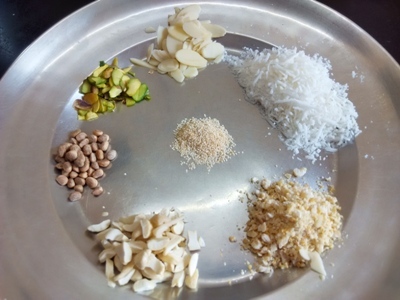 Dry fruits must be sauté with clarified butter on the low flame or else the dry fruits may burn and will give burnt flavor to the sheer khurma. When the dry fruits turn to golden brown color, do not add milk directly. 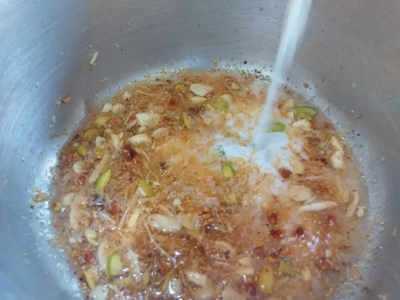 Add water and allow it to settle and then add milk to the dry fruits or else it will turn to sour milk. I have used saffron which gives the sheer khurma a rich saffron color. 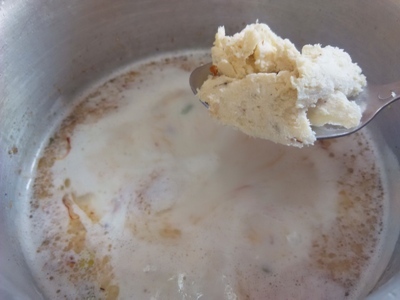 Khoe or condensed milk increases the thickness of milk and provides creamy flavor. Sheer khurma contains milk and dry fruits in great quantity it is an excellent dessert to have in winters. Sheer khurma provides lot of heat and warmth to your body. Winters are soon to come, try this rich dessert and serve hot. You can serve chilled sheer kurma but I prefer to have hot. As I belong to a mughal family and love to make mughlai dishes. I always try to make new mughlai recipes at home with my mom, she is a great cook. I will surely share some more mughlai recipes with you. Now let’s see how to prepare sheer khurma. 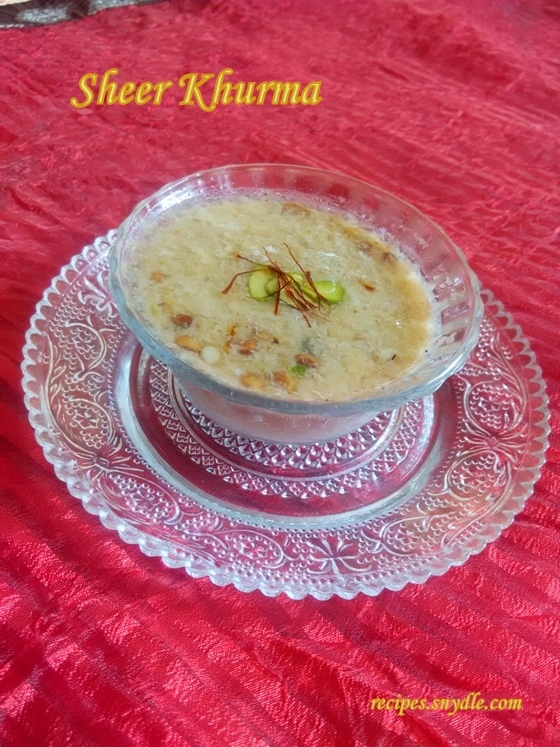 Sheer Khurma yields 4 servings. For the purpose of measurement, 1 cup = 250ml. 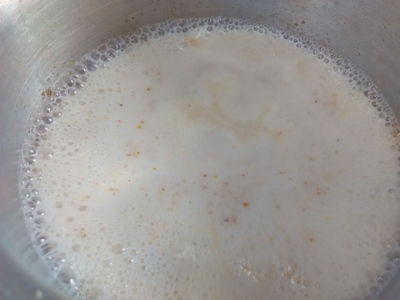 How to make Sheer Khurma with step by step pictures. 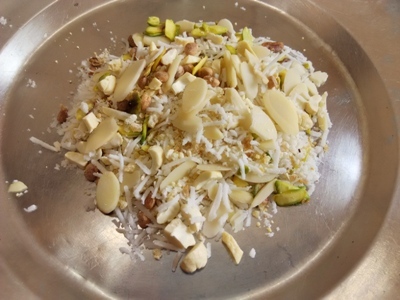 Mix the sliced almonds, sliced pistachios, sliced cashew nuts, poppy seeds, coarsely grinded dates, charoli/chironji and grated coconut well. Heat a cooking vessel and add clarified butter to it. 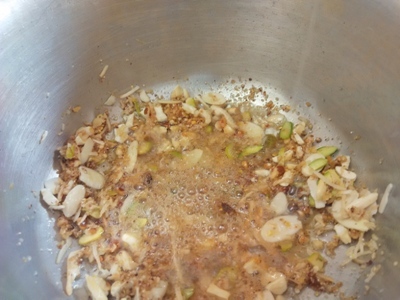 Add the mixed dry fruits to the clarified butter. Reduce the flame to low. 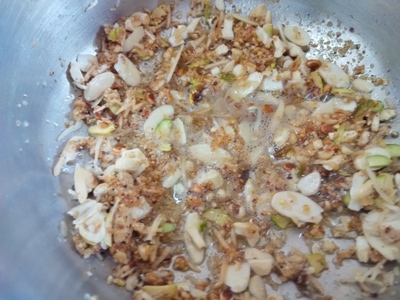 Continuously stir the dry fruits till it turns to golden brown colour. Now add 50ml of water to the cooking vessel. First add water than milk or it might turn to sour milk. Add milk to the cooking vessel and increase the flame. Add vermicelli to the cooking vessel. Mix it well. Now add sugar to the cooking vessel. Mix it well. 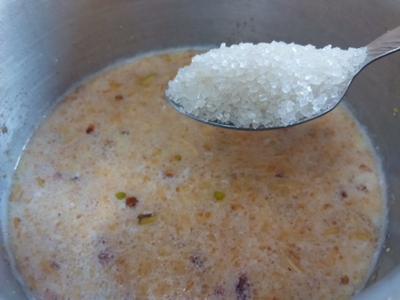 Allow the sheer khurma to take a boil and sugar to melt. Reduce the flame when the sheer khurma comes to boiling point. 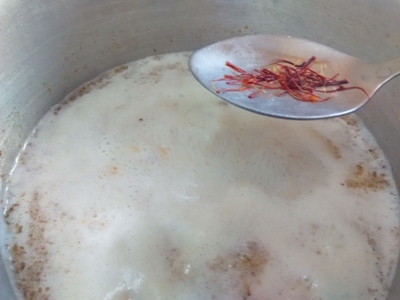 Add kesar/saffron to the sheer khurma and stir well. Add khoa/condensed milk to the sheer khurma. Mix it well. 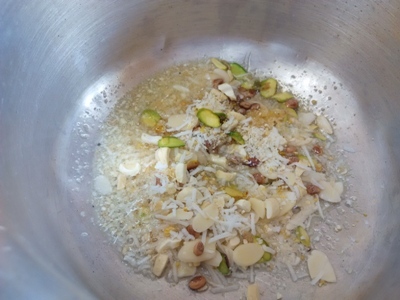 Cook the sheer khurma for 5 – 7 minutes on low flame till the sugar and khoa/condensed milk are melted. Sheer khurma is ready to serve. Garnish the sheer khurma with sliced pistachios and kesar/saffron strands. Serve hot. Enjoy! Previous Post: Soya Bean Kebab Recipe.